This spring my daughters and I tapped our Sugar Maple in the back yard. While standing over the boiling sap it occurred to me that just as forty ounces of maple sap is reduced to one ounce of maple syrup, the dozens of proposed solutions to climate change can be similarly reduced to three major strategies. The first two usually garner the most attention – consume less and produce energy in a cleaner way. However, there is a third critical part of the equation, although often overlooked, that must also be addressed. This is to sequester the excess carbon dioxide that is already in our atmosphere. More carbon dioxide is in the atmosphere now than at any point in the last two to four million years. The last time carbon dioxide levels were above 400 parts per million, as they are today, sea levels were 100 feet higher and crocodiles lived in Greenland. Even if we were to completely end all carbon emissions tomorrow, we will still be left with a major problem. Carbon can be drawn out of the atmosphere through the conservation of healthy forests. Fifteen percent of the carbon emitted by humans in the United States is absorbed by forests. Two-thirds of this carbon is stored in the soil. If we are to have healthy, carbon absorbing forests, soil health is essential. Looking down at our feet may not be such a bad idea after all. 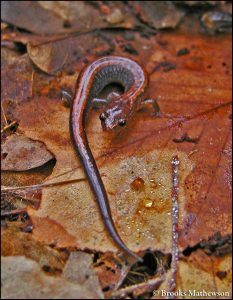 Healthy ecosystems need top-level predators, and in this region the most important top-level predator of the forest floor is the diminutive eastern red-backed salamander. These small, slender amphibians are fully terrestrial, breeding in moist locations under rocks and logs. Liberation from the stereotypical amphibian life cycle constraints has enabled red-backs to be widely distributed throughout the forest as opposed to within a narrow range of territory in close proximity to a wetland. In fact, red-backs are the most abundant vertebrate in the forest, with a biomass equivalent to twice that of all the breeding birds. By preying on soil invertebrates that shred leaves, red-backs slow down the rate at which leaf litter decomposes, immobilizing more carbon to be stored in the soil. Surprisingly, extensive searches at Mount Auburn from 2013 to 2015 did not produce any observations of red-backed salamanders. One reason for their absence may be that the species was unable to survive through the period in the early 1900s when the Cemetery was more open with less extensive tree cover. Today, however, major ecological restoration efforts in the forest at Consecration Dell make this area of Mount Auburn an ideal spot to reintroduce a species that undoubtedly was present in the past.After receiving permission from the State of Massachusetts Division of Fisheries and Wildlife and the Watertown Conservation Commission, thirty-one eastern red-backed salamanders were reintroduced in the fall of 2017 to the upland woods in Consecration Dell. This spring another fifty red-backs will join them. Rough-cut, untreated, boards have been set out as habitat around the paths surrounding the Dell Pond. Over the course of year I will monitor these cover boards to assess the status of the reintroduced population of salamanders. 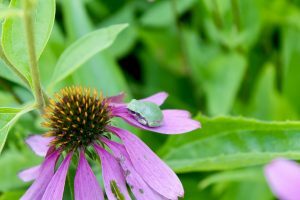 It is our hope that red-backs will begin to successfully breed and join the other species of amphibians successfully reintroduced to Mount Auburn Cemetery by Dr. Joe Martinez in past years including American Toad, Spring Peepers, and Gray Tree Frog. Thank you. This is so interesting. Good luck. I always learn something from you. Did not know the red-backed were fully terrestrial. Now I know why those boards are there….. I am alocal professional gardener and would love to help. Volunteers? An ecologist boiling sap with his daughters and then talking about excessive carbon in our atmosphere. …That’s interesting. But anyways, its GREAT to hear about the reintroduction of the red-backs. Thanks! and good luck to them. We’re also trying to reintroduce redbacks to one of our parks this fall. Would love to share information with you. We wish you luck Ellen! I am passing your comment along to Paul Kwiatkowski who is our Sustainability Manager here at Mount Auburn.